KOTOBUKI TEC (THAILAND) CO., LTD.
SHIPPO ASAHI MOULDS (THAILAND) CO., LTD.
SNN TOOLS & DIES CO., LTD.
DATA DESIGN SOLUTIONS (THAILAND) CO.,LTD. Murakami Mold Engineering (Thailand) CO.,LTD. 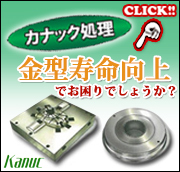 Automotive Mold Technology Co., Ltd.
C.C.S. ADVANCE TECH CO., LTD.
NAGANO PRECISION (THAILAND) CO., LTD.
AAPICO HITECH PUBLIC CO., LTD.
CHUO KAKO (THAILAND) CO., LTD.
THAI INTERNATIONAL DIE MAKING CO., LTD.
SOODE NAGANO (THAILAND) CO., LTD.
NISHII FINE PRESS (THAILAND) CO., LTD.
THREE ARROWS PRECISION CO., LTD.
Nitriding Surface Treatment and PVD Coating services.Providing world-class and history-proven surface improvement technologies.